Your blogger has been busy working on a book about metropolitan Rio de Janeiro. This is why she’s been writing less in the blog and leaving readers in the lurch. There’s been no analysis of the recent explosion of violence in the Alemão favela complex. On April 2, the pot came to a boil. Ten-year-old Eduardo Jesus Ferreira was shot in the head while playing with a cell phone on the stairs of a favela alleyway, steps away from his mother. According to press reports, days later a military police officer said he thought he fired the shot in the heat of the action, thinking the phone was a weapon. Governor Pezão commented that police intelligence have photos of children bearing arms, and ordered the “reoccupation” of the Complex. Militay police complained of horrendous work conditions. The governor had armored police posts installed so they could benefit from greater protection. 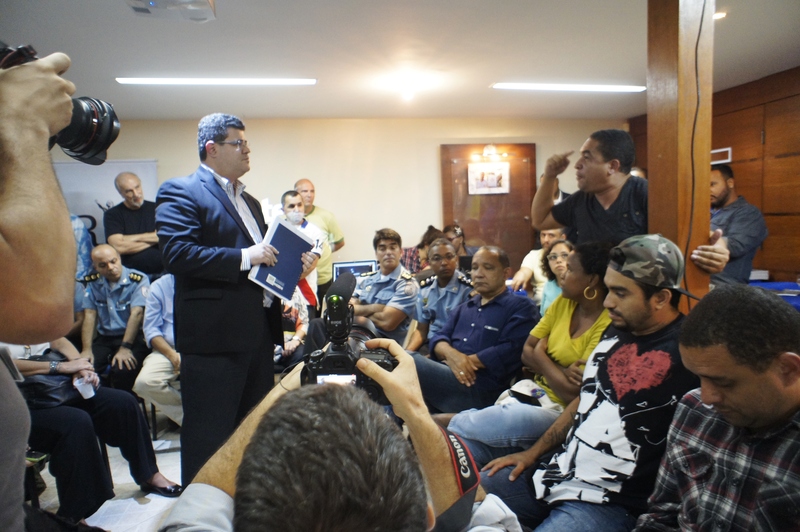 Thursday night a Forum was held, bringing together residents, neighborhood association leaders, government officials, police, researchers and others — about 120 people total, for four hours of dialogue in the Glória neighborhood. This was the perfect moment to start talking about violence in Alemão, for the blog and for everyone. The Forum was organized by the O Dia newspaper, the CESeC research group, specializing in youth, police, violence and the penitentiary system, and the Instituto de Estudos da Religião, which focuses on human rights. There have been several write-ups of the event, so here are just a few key aspects. Brazil’s history as an authoritarian slave society, with its dependent and unequal relations, still weighs heavy. Change is so difficult! Residents complained of a police-imposed curfew, disrupting the lives of workers and students. Up to now there has been no real conversation between the police and the community – Ignacio Cano, coordinator of the Laboratório de Análise da Violência, at UERJ. Democracy is about the common good. It means taking on the responsibility to promote the common good, above lesser interests. It means making constant appraisals of individual interests as opposed to collective ones. It’s about leading more and reacting less. Each person defines his or her role and fulfills it. Residents said the cable car system was to halt service today, April 11, for “maintenance”, with no date set for resumption. All cultural spaces are occupied by the police… the elite squad, BOPE, makes fun of the pacification police. “You’re not up to the job,” they say, as they pass by. – Raul Santiago, from the Papo Reto journalism collective, recently portrayed in the New York Times. 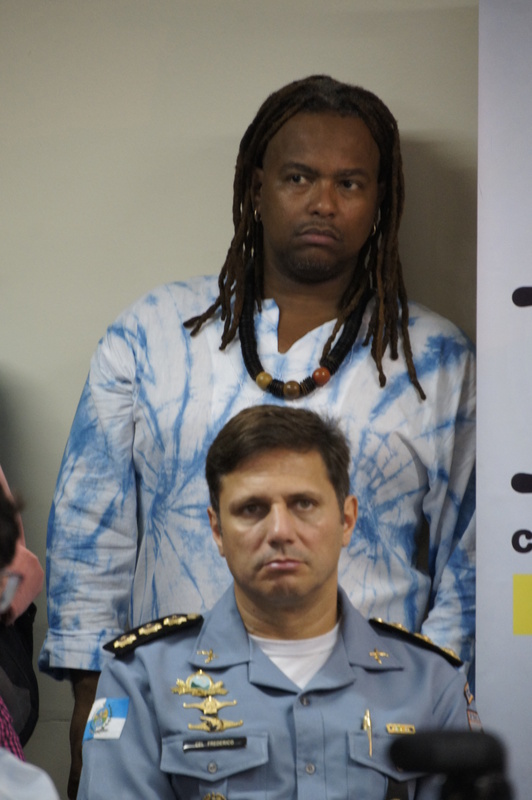 Pezão should set up a crisis room in Alemão. – Junior Perim, executive director of the Crescer e Viver circus school. Perhaps the war is between uniformed and non-uniformed criminals — or not. But the war, which is killing dozens of innocents, is about drugs. People aren’t fighting because of religion, a border or ideology. Drugs stir up disputes over power and territory. Must we die for drugs? A resident said that the drug traffic in Alemão is retail, that there are no big traffickers there. We’re imprisoned in our homes, this is Governor Pezão’s peace pact. We’re running away from bullets all the time — Kléber Araújo, shopowner. This entry was posted in Brazil, Transformation of Rio de Janeiro / Transformação do Rio de Janeiro and tagged Complexo do Alemão, Fórum Complexo do Alemão, Guerra no Alemão, Rio de Janeiro violence, War in Alemão complex. Bookmark the permalink.